Thermal compounds have a very specific role in water cooling systems. They are designed to fill microscopic gaps between two solid surfaces, facilitating the movement of heat. No matter how flawless a surface may appear, it is highly irregular on a microscopic level. In fact, a CPU and cold plate or heat sink may only touch at 0.01% of their total surface areas. Because the rest of the surfaces are separated by air, many high-heat sources would fail without a thermal interface material. There are different types of interface materials for different applications and heat sources. A relatively low heat source, such as a memory chip, is typically encased in black plastic. It may not require high contact pressure or an interface material with high thermal conductivity. As heat increases relative to surface area, the interface material becomes more critical. 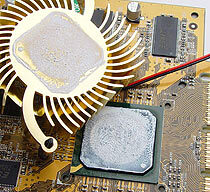 Higher heat sources like a computer CPU and GPU commonly use liquid-like pastes. 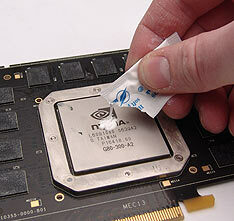 For high heat sources, it is a common mistake to use too much thermal paste. 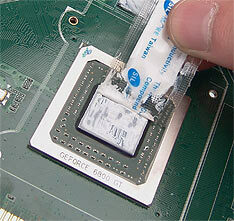 Remember, thermal compound is only used to fill small irregularities between two surfaces. For a heat source and water block, 100% direct metal-to-metal contact would be ideal if it were possible. Heat moves more slowly through thermal paste than solid metal. With this in mind, applying thermal paste is relatively straightforward. Use the minimum amount that will still cover the heat source in a fine, often translucent layer. Start with a small "pea-sized" drop in the center of the heat source. Spread the paste with a thick piece of paper or plastic (such as a business or credit card). If more paste is required, it should be added. If too much has been applied, wipe the excess with a paper towel. 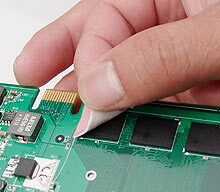 NOTE: Many thermal pastes are electrically conductive. Do not apply too much or it could end up being squeezed out onto nearby components when the water block is mounted.